Fundamentals of Electrochemical Supercapacitors. 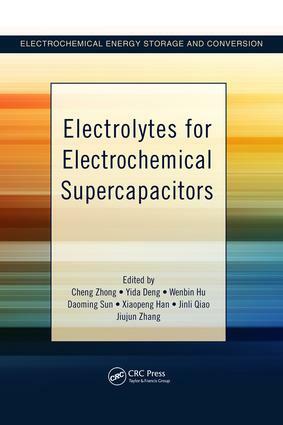 Electrolytes for Electrochemical Supercapacitors. Compatibility of Electrolytes with Inactive Components of Electrochemical Supercapacitors. Electrolyte Performance Validation Using Electrochemical Supercapacitor Cells. Challenges and Perspectives of Electrochemical Supercapacitors. Cheng Zhong is an associate professor in the School of Materials Science and Engineering at Tianjin University. Prior to joining the faculty at Tianjin University, he worked as an associate professor in the State Key Laboratory of Metal Matrix Composites in the Department of Materials Science and Engineering at Shanghai Jiao Tong University. He earned his BSc and PhD in Materials Science from Fudan University in 2004 and 2009, respectively. Dr. Zhong's recent research interests focus on the development of electrochemical metallurgy methods for preparing micro/nanostructured materials for electrochemical and electrocatalysis applications. Yida Deng is a professor in the School of Materials Science and Engineering at Tianjin University. He earned his PhD from Shanghai Jiao Tong University in 2006. Dr. Deng's research interests include metal and metal oxide nanostructures for electrochemical and energy applications. Wenbin Hu is a professor and dean of the School of Materials Science and Engineering at Tianjin University. Previously, he worked as a professor in the Department of Materials Science and Engineering at Shanghai Jiao Tong University. He holds a BSc and PhD from Central-South University and an MSc from Tianjin University. Dr. Hu is a member of the Expert Group on Advanced Structural and Composite Materials in the new materials field of China's 863 Program (National High-Tech Research and Development Program). He received the support of the National Science Foundation for Distinguished Young Scholars of China in 2011. Dr. Hu's research interests focus on advanced micro/nanomaterials for energy storage and conversion.